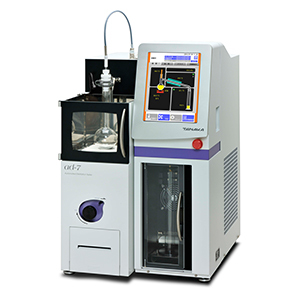 Automated Distillation Tester ad-7 - Glorious Green PCB Co.,Ltd. It’s been over 50 years since we started manufacturing automated distillation testers. Nowadays, we deliver to customers in more than 70 countries. ad-7 automatically performs distillation test of petroleum products prescribed in “Standard Test Method for Distillation of Petroleum Products at Atmospheric Pressure”, as well as narrow boiling range samples with optional temperature sensor. Premium : Premium design for extended pro use. Versatile : Enhanced functions for more elaborate analysis. The world’s smallest class size of footprint. Cooling/Heating by Peltier Cooling system. 10.4 inch Color LCD that is 4 times larger than previous model. Intuitive operation by Touch Panel. 200 test modes can be recorded. Test mode for unknown sample is available. Test with less than 100ml sample is possible. 5,000 test results can be stored. Pt 100 for Vapor, Condenser, and Receiver room. Overheat protection. Warning device for fire. RS-232C, USB , Ethernet 1ch each.